I would venture a guess that most adults have a book or a story that in some way has helped to lay the foundation for the person they’ve become. For me this was The Little Prince by Antoine de St. Exupéry. On my bookcase I must have at least six copies in four languages. So you can imagine my excitment as I found myself on a plane to Morocco, flipping through my Lonely Planet and realizing that I was arriving in Marrakesh at the same time as the Rallye St. Exupéry – a flight from Toulouse to St. Louise, Senegal with a stop right outside of Marrakesh, all done in honor of the French Air Mail service. This route is one that Antoine de St. Exupéry flew as a member of the Air Service and contributed significantly to the storyline of his most popular book. I closed my Lonely Planet, looked out the window and wondered if fate had a hand in placing me on this plane at this time. Maybe there was a reason behind it, or maybe it was just a moment of sweet coincidence, something to remind me that I was in the right place and on the right path. Whatever the case, I knew I was in the right place when I stepped off the plane in Marrakesh and felt like I was walking into my home. It was that delicious feeling of first experiencing a place you’ve never been but already know. It is such a rare and magical feeling. I personally have only ever felt it twice before, once upon arriving in Italy and the second time a few years later on the streets of Kathmandu. Even without the instant attraction, it would be almost impossible to not become enchanted by Marrakesh. The colors of yellow sand, orange dirt and blue sky are dotted with greens and reds. Diesel and dust mix with the smell of fires and spices, pomegranate and mint. As I wander the streets, I watch the ebb and flow around me and try to find another city to equate it to – Delhi, Dakar, and Cairo all come to mind, except that here there is an inescapable French air. The mixture is enticing. In the old city walls, the streets are small and winding. The cobblestones beneath your feet add that last element of surprise and inconsistency. Motorbikes scoot by. Stalls of shoes, fabric, pottery and carpets seem to be overflowing and spilling into the streets and onto the walls. I try to figure out which one of my sense is not on hyperdrive and come up with nothing. I meet ex-pats that have lived here for years and still don’t know their way around the maze that is the Medina. At the edge of the walls, the food markets buzz with people and flies. There is a heat in the air that is tangible even on this late fall day. 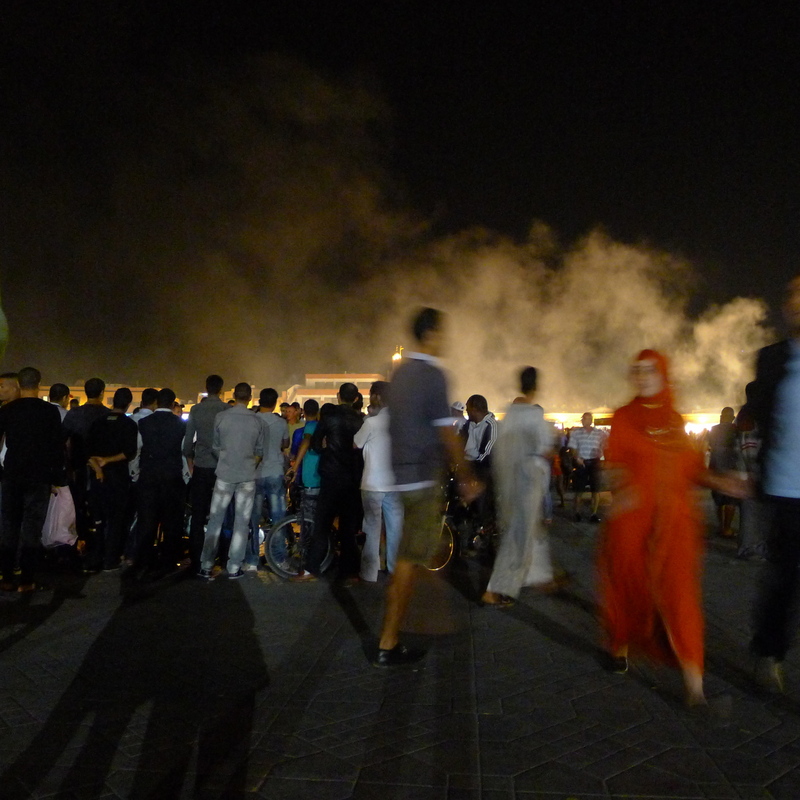 The main square, Place Jamaa El Fna, is packed with people every time I walk by. As the sun sets, food stalls fill the air with delicious smells, ladies wait on plastic benches for customers to partake in their henna offerings, and lanterns and trinkets cover blankets thrown along the edges of the crowd. 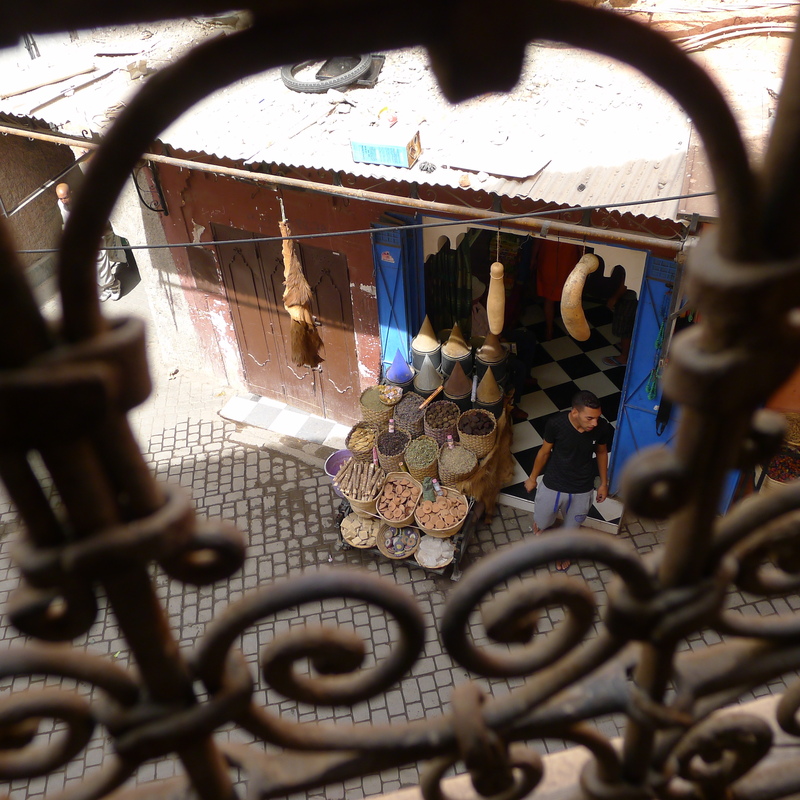 There is a constant buzz in the air that seems to cover the whole city, and yet all it takes is a tuck behind a riad door, and you would imagine yourself transported to another world, quiet, peaceful, and miles away. As night turns to day, the air fills with the call of small birds and a soft breeze. As day turns to night, sparkling lights fill the city and the call of the muezzin echoes off of the plastered walls. After only four short days, it feels as though anything you can imagine, you can find in Marrakesh – even, perhaps, a small lost boy with a tamed fox.